Trump said he doesn't care about being popular. But check the record. He's tweeted 261 times about ratings. After years of exaggerating the size of his crowds and his poll numbers, President Donald Trump made a surprising statement Wednesday — he said he's not worried about being popular. "I don’t care who's endorsing you or not endorsing you, you're going to be more popular if that's what you're into. 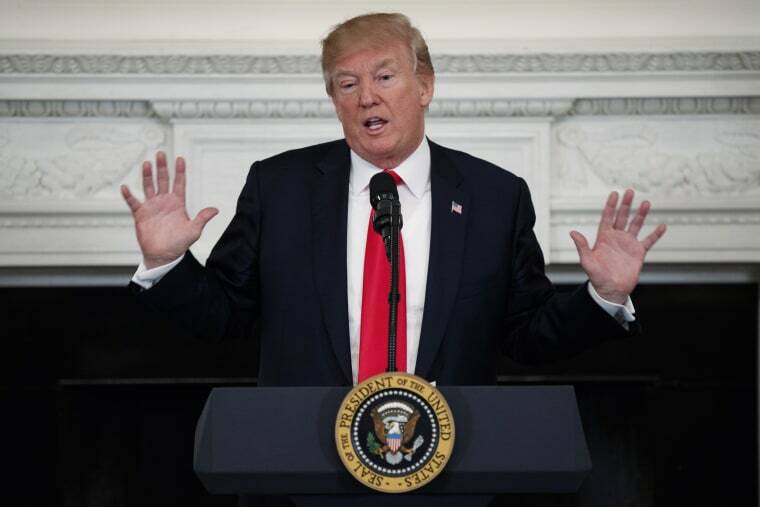 I’m not into popularity, I’m into getting something done that's good," Trump said during a conversation about gun control with lawmakers at the White House. But the record shows Trump obsesses about his popularity. "I think I’m very popular in your country," Trump told British broadcaster Piers Morgan in January, amid news of protests over a potential visit by the president. "I believe that, I really do. I get so much fan mail from people in your country. They love my sense of security, they love what I'm saying about many things." "We got 306 (Electoral College votes) because people came out and voted like they've never seen before so that's the way it goes. I guess it was the biggest Electoral College win since Ronald Reagan,” Trump said last year at a press conference. Trump Electoral College number (it was 304, not 306) was in fact not the biggest since Reagan. President Barack Obama won more Electoral College votes, twice. "We were unbelievably successful in the election with getting the vote of the military," Trump told an audience the Central Intelligence Agency on his first visit there as president. "And probably almost everybody in this room voted for me, but I will not ask you to raise your hands if you did." "The overall audience was, I think, the biggest ever to watch an inauguration address, which was a great thing," the president said on Jan. 26, 2017, six days after he was sworn in. Ample evidence refutes this claim, as NBC News has previously reported; Barack Obama's 2009 inauguration had a larger audience. The president has tweeted 261 times about crowds, according to the Twitter Tweet Archive: 53 were "big" crowds, 19 were "record" crowds, and three were about rivals' "small" crowds. Trump routinely boasts about his own ratings and condemns the ratings of those he does not like. He's tweeted 260 times about ratings, 28 of them since becoming president, according to the Twitter Archive, boasting about his own TV ratings and the ratings of Fox News, while slamming the ratings of those he does not like, including Arnold Schwarzenegger, NBC News and CNN, to name a few. “He said once I'm the single greatest president in his lifetime," Trump recalled of a comment he said was made by Sen. Orrin Hatch, R-Utah. "He actually once said I'm the greatest president in the history of this country." Hatch later suggested the president had exaggerated his comment.